Floratrex probiotic and prebiotic is one of the most complete and advanced probiotic supplements available. Each serving contains 50 billion live active CFUs from 23 of the most beneficial strains of bacteria. It’s important to invest in nutritional supplements produced by a responsible manufacturer and that's doubly important when it comes to probiotics. The manufacturer of Floratrex employs the highest quality manufacturing standards in the production of Floratrex to ensure maximum potency. 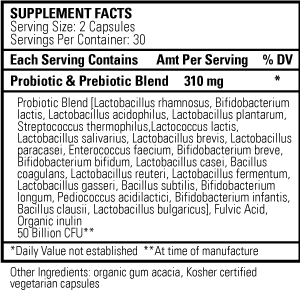 This advanced probiotic formula provides 50 billion CFUs. Provided by a manufacturer who pioneered the process of combining multiple strains of probiotics with beneficial prebiotics. Added as a safe flow agent instead of adding toxic fillers, binders, and excipients. Many substances were researched and and it was found that organic acacia gum was the most superior option. Enteric coating is a type of layer put on the probiotic capsule and intended to promote survival of the beneficial bacteria in your GI tract. The manufacturing process of Floratrex negates the need for enteric coating.